someone knows how many time takes to give mana crystal to NPCs after you give? Tejesueños 98-110 Val'sharah ~0/12k Honored ¡Bienvenidos a Val'sharah! At level 110 you will get Uniendo las islas quest. Las Celadoras target all 5 zones with WANTED and DANGER quests. You will always get 1 reputation Insignia like Insignia de la tribu Monte Alto superior. The list is at the bottom of this post. You can get +250 reputation Insignia (like Insignia de la tribu Monte Alto) from lots of treasure chests in all 5 zones. You need 8 000 / 12 000 Honored with the Nightfallen to gain acess to Court of Stars and The Arcway. Beyond that, rep isn't worth farming unless you're going for the pet: Ojo apagado, toy: Máscara de fiesta casera, professions recepies or the 850 Shoulders. When you hit 8000/12000 Honored with the Nightfallen, you unlock the Statecraft quest line (and access to Arcway and Court of Stars mythic-only dungeons). Broken Isles Pathfinder, Part One, which will be required in order to unlocking flying in legion in later patches. It's definitely not useless to keep raising this rep.
Edit: As yzq85 noted, you will need 20000/21000 Revered to unlock A Change of Seasons. 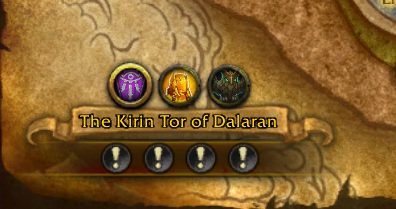 In case you're like me, on your alt and having a bit of a senior moment, forgetting how exactly you start questing with this faction... it's El descubrimiento de Khadgar, in the Violet Citadel in Dalaran. You can't just rock up in the zone and start dealing crystal meth ancient mana to Nightfallen. I seem to be having the same issue w/ profiler still reports that Nightfallen and Valajar r at 0% whem in fact I'm Revered.Is this a Wowhead reporting flaw? Anyone else have this, an found a work around or something? Been reporting this for a week or more. It might just be me, but every time I see one of these Nightfallen standing around in withdrawal, they remind me of Tyrone Biggums. I'm waiting for one to say "Give me some crack!" Be prepared for the most painful grind of your life. These guys are flat useless. You do everything for them. Theyre fully functioning when doped up and yet do nothing at all. Whats more, while you're taking care of them (which doesn't involve pushing demons out of the city for some reason), their rep rewards are low. The high rewards are on irritating random/rotations. For everyone who wants more than one classes' order hall shoulders, my condolences. Lots of talk in these comments citing the need for certain reputation requirements for quests to unlock. From Patch 7.3 (Hotfix August 29, 2017), Nightfallen reputation requirements have been removed. This is great for alts or, like me, returning players. Estos elfos Nocheterna exiliados sufren los efectos de la abstinencia provocada por su falta de conexión con la Fuente de la Noche. Se oponen a la alianza de su pueblo con la Legión y luchan por encontrar una cierta redención.